A number of people have already shared some variant of the chart below on Twitter. It shows Google search interest in: Donald Trump (blue), Hillary Clinton (red), Bernie Sanders (yellow), Ben Carson (green), and Jeb Bush (purple). Since announcing his run in mid June, Trump has enjoyed notably higher search interest than any of the other main contenders, mostly likely in part because of his frequent gaffes. There was a surge of interest in Clinton around the time of her announcement, which has subsequently faded. Interest in Sanders has been growing over time; it reached its local maximum around the time that his Seattle speech was interrupted by Black Lives Matter protestors. Purely for amusement, I thought I'd compare the candidates by number of Twitter followers and number of Facebook likes. Clinton and Trump are at the head of the pack on Twitter followers, each racking up more than 4 million. This is almost certainly attributable, at least in part, to their longer-standing notoriety. In the case of Facebook likes, Trump and Carson (somewhat surprisingly) lead the way, each tallying more than 3.5 million. 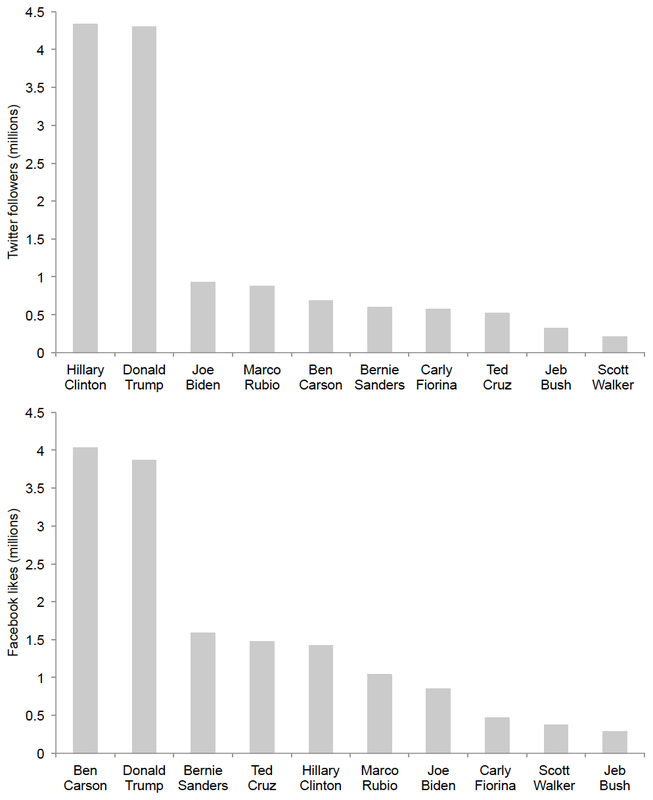 Clinton has noticeably fewer Facebook likes, while Bush ranks feebly on both measures. In spite of the foregoing, Clinton is currently favourite to win, with Bush in second, Biden in third, Trump in fourth, and Sanders in fifth. Thinking about the British Empire, would you say it is more something to be proud or more something to be ashamed of? Overall do you think the countries that were colonised by Britain are better off or worse off for being colonised? 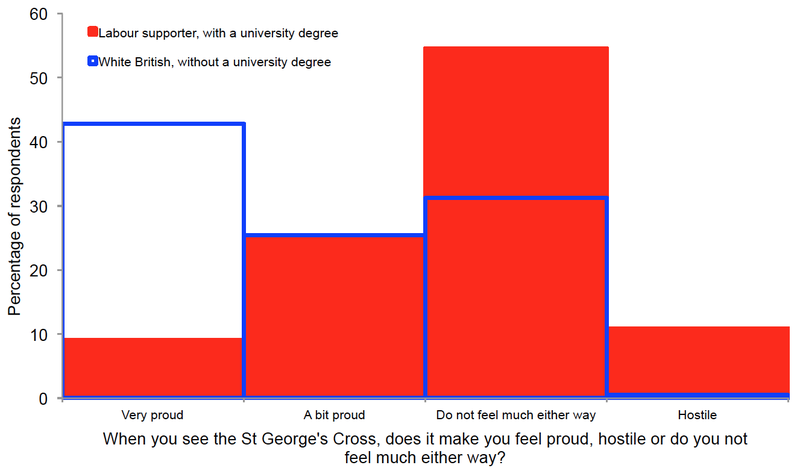 49% of respondents answered "better off", and only 15% answered "worse off". Interestingly however, when asked, "Would you like Britain to still have an empire", only 34% said yes, while 45% said no. Intriguingly, all the Eastern European and Anglo countries are clustered at the top of the list, while all the Mediterranean countries are clustered at the bottom; the Continental countries and the Nordics are clustered in the middle, except Sweden, which is fourth from bottom. The only countries with both a small gap and relatively low overall unemployment are the four Anglo countries plus the Czech Republic. It would of course be interesting to see these figures for 2015, but they don't seem to be available yet. Housing is an intractable problem because the Tories don’t want rural development, which upsets their Nimby supporters, and Labour are pro-immigration but unwilling to accept that four million new residents means four million new residencies, and that building them is not easy on an already crowded island. I would add that some Tory big-business donors push for high immigration, while some left-leaning environmentalists oppose rural development. Sticky prices. Think about it. If prices adjusted with complete freedom in response to competitive forces, then the actual amount of currency in an economy simply would not matter. Expansionary monetary policy reduces the value of the currency, which allows prices to fall without their nominal value changing. A key prediction of this theory is that recessions should take much longer to recover from in the absence of either expansionary monetary policy or expansionary fiscal policy funded through borrowing. Indeed, the fact that most countries, such as the UK and the US, have had massive secular inflation since the early the 20th century is a testament to how influential the theory has been. In this context, it is interesting to note that between about 1815 (when Wellington's victory at Waterloo brought an end to the Napoleonic wars) and about 1850, Britain experienced rising GDP per capita, deflation and falling government spending. 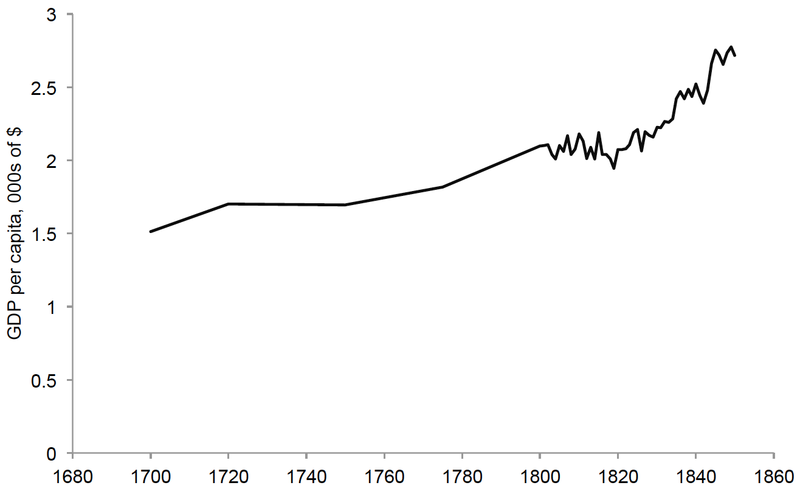 The first chart (below) plots GDP per capita in Britain between 1700 and 1850, using data from the Maddison Project (which are not reported for Britain after 1850). 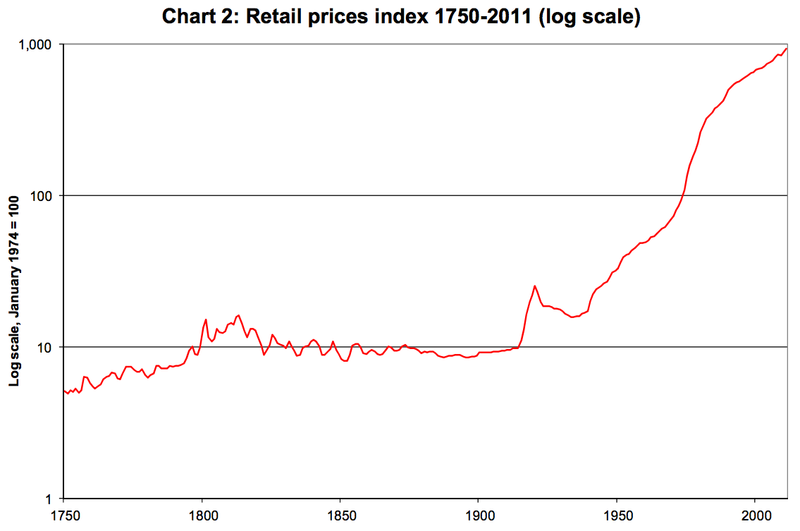 The second chart, which is taken from a parliamentary report on the historical value of the pound, plots the retail prices index between 1750 and 2011 (on a log scale). And third chart, which is taken from Gregory Clark's book A Farewell To Alms, plots government spending as a percentage of GNP in England between 1285 and 2000. 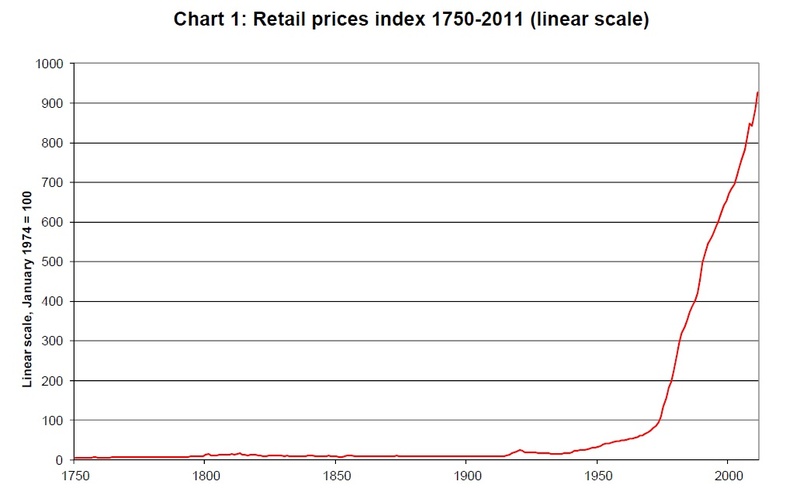 The three respective charts show that, between about 1815 and about 1850: GDP per capita took an unmistakably upward trend; the retail prices index declined in a haphazard fashion and then roughly stabilised; and government spending as a percentage of GNP collapsed from ~30% to ~18% before decreasing further to ~12%. Prima facie, these observations would seem to be inconsistent with Keynesian theory. Five possible explanations are as follows. First, all three series contain too much measurement error to be reliable. Second, output per capita didn't actually grow that fast: only ~1% per year on average. 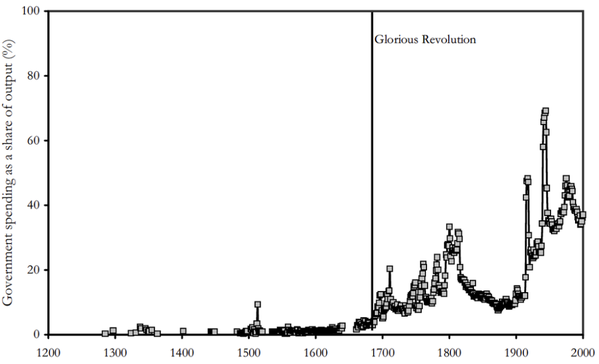 Third, output per capita increased simply because of "pent up demand" from the period encompassing the Napoleonic wars. Fourth, prices tend not to be quite as sticky when the economy is smaller and less complex. Fifth, prices tend not to be quite as sticky when there are fewer labour market regulations. I'd be interested to know if anyone has another explanation or would argue that the data are in fact perfectly consistent with Keynesian theory. Yesterday on his blog, Paul Krugman argued that it is incorrect to attribute the decline in GDP and concomitant rise in unemployment in Greece to misguided supply-side policies. Rather, the only factor that can be understood to have caused the massive Greek recession is the Euro, i.e., Greece's inability to devalue its currency. (And fiscal austerity imposed by the troika presumably hasn't helped). I would argue that it’s very, very wrong to point to factors limiting Greek productivity and claim that these factors are the “cause” of the Greek crisis... The main answer, surely, is the euro: by adopting the euro Greece first brought on massive capital inflows, then found itself in a trap, unable to achieve the needed real devaluation without incredibly costly deflation... Every time someone asserts that the Greek problem is really on the supply side, you should ask, not whether it has supply-side problems––it does––but why this should lead to collapse. To make his point, he draws a comparison with Poland, a country with similar productivity to Greece but which weathered the financial crisis remarkably well. Consider, in particular, a comparison that should be made––between Greece and Poland. Poland, like Greece, is a country on Europe’s periphery, closely linked to the rest of the European economy. It’s also a country with relatively low productivity by northwestern European standards... But Poland has not had a Greek-style crisis, or indeed any crisis at all. Instead, it has powered through the turmoil of recent years. Krugman is surely right that Greece's inability to devalue has contributed substantially to the current mess that it's in. Equally however, one shouldn't ignore the supply-side altogether. If I understand the Keynesian model correctly, because wages are sticky downward, excess involuntary unemployment occurs during a recession when the central bank fails to adequately bolster nominal wages through monetary expansion. This means that, all else being equal, any policies (such as minimum wages, hiring and firing rules, bans on zero-hours contracts etc.) which prevent wages from adjusting downward should worsen unemployment during a recession. And Greece appears to have many such policies; certainly more than Poland. In the Fraser Institute's index, Greece is ranked 138 for labour market regulations, while Poland is ranked 34. In the Heritage Foundation's index, Greece is ranked 131 for labour freedom, while Poland is ranked 101. 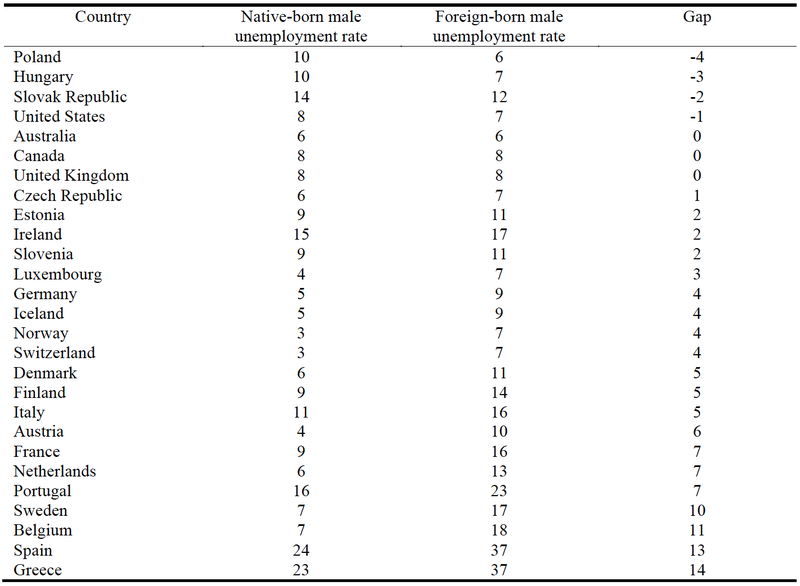 And In the World Economic Forum's index: Greece is ranked 109 for labour market flexibility, while Poland is ranked 79 (averaging across the 6 relevant metrics). Indeed, Greece ranks much lower than Poland on overall indexes of competitiveness too: on the Fraser Institute's index, the Heritage Foundation's index, the World Economic Forum's index, and the World Bank's index. When Keynesians want to gloat, they often point to the overwhelming empirical evidence in favor of nominal wage rigidity. For the latest example, see Krugman on the Irish labor market. Their unemployment is 14.5%, but the nominal wage index has only fallen by about 2.5%... The gloating is easy to understand. After all, nominal wage rigidity is the driving assumption of the Keynesian model... What's hard to understand, though, is Keynesian neglect of––if not outright hostility to––the logical implication of their argument: Wages must fall! In point of fact, however, wages in Greece have fallen quite considerably. Yet unemployment there is still around 25% (but falling). This would seem to imply that the situation is a little more complicated than I have suggested. But I also can't see how it vindicates Krugman's argument. Why would reduced real wages only help to bring down unemployment when the reduction occurs through monetary devaluation? Perhaps someone with a better understanding of economics can explain it to me. One possibility is that Greece would be on the road to recovery by now if the country's lurch leftward hadn't upset the animal spirits of Greek entrepreneurs. Spurred by my previous post, a friend points me toward another swift, cathartic lash of national self-flagellation in the Guardian. Having just been voted in as our national bird, the humble English robin is laid bare for the monster that it truly is: "a vicious murdering bully... brutish, ruthless and ready to ruck... a hooligan bird that puffs up big, jealously guards its patch and... Oh, right, I see what you mean now". In this context, it is revealing that the Guardian––the newspaper of record for Britain's progressive elites––feels comfortable wearing its distaste for Britain's national pastimes on its sleeve. Apparently, the Union Jack is "ugly and divisive"; a Sunday roast is "oppressive and outmoded"; tea is "a national disgrace"; and brown sauce is "a product of the British empire, and should have gone the same way".